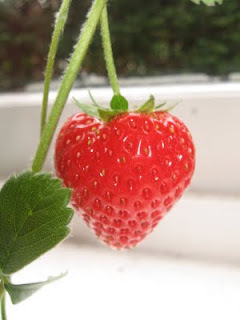 I have a tiny strawberry plant in the garden which produces around 3 strawberries a year but all get each by either birds, snails or slugs. Every year Im always excited to eat the strawberries as I've been watching them slowly grow but never learn to eat them before the animals get them. So this year as soon as I saw a strawberry growing I took the plant pot and put it by the window in my front room and look what grew! This is the first strawberry and it was huge, I ate it today and it was perfect. Theres 3 others growing at the moment and I can't wait to eat them.